On nuclear issues – India and Pakistan came close to the brink. And the media is awash with propaganda about nuclear energy being essential to combat climate change. Especially propaganda about “new nukes” – small nuclear reactors (SMRs) . The reality is that it’s desperate hubris about a nonexistent technology without a future. Despite heavy promotion, SMRs are too expensive and there are no buyers. Before we enter “a new nuclear age” – learn from the newly declassified Chernobyl health records. Risk of nuclear weapons use is now at a record high.- Nuclear weapons accidents and losses 1950s – 2000s. Challenges in Nuclear Verification– IAEA . Julian Assange, Chelsea Manning, and the campaign to criminalise whistleblowing. Reflective roofs can reduce overheating in cities and save lives during heatwaves. EUROPE. European Parliament votes to exclude nuclear power from receiving a green stamp of approval on financial markets. JAPAN. Japan Business Federation, Keidanren, wants maximum service life of nuclear power plants extended to over 60 years. Few evacuees are likely to return next week to parts of Okuma, host of Fukushima nuclear plant. New legal action compensation claim by 25 Fukushim evacuees. Japanese panel says that people under 40 should have iodine tablets ready, in advance of nuclear emergencies. Absolute stalemate in nuclear negotiations, but Trump says that his relationship with Kim Jong-un is“very good.” U.S. Secretary of State Mike Pompeo hopes that North Korea will just hand over its nuclear weapons to USA. U.S. Congress members angry at Trump govt’s approval of licences for exporting U.S. nuclear know-how to Saudi Arabia. Democratic presidential candidate Tulsi Gabbard slams decision to sell Saudi Arabia nuclear weapons tech. Green New Deal must not include nuclear power, which is not a viable solution to climate change- Friends of the Earth. Hanford nuclear mess; the clean-up is delayed by the Trump administration. Trump govt allowing nuclear power stations to Regulate Their Own Safety. Nuclear Regulatory Commission fails to recognise the real danger of dirty bombs. Nuclear Device Assembly Facility In Nevada Desert at risk of earthquakes. Another new nuclear gimmick going way over budget – the “Virtual Test Reactor”. Rewarding failure: Taxpayers on hook for $12 billion Vogtle nuclear boondoggle. Nuclear industry is aggressively milking USA States for subsidies, despite Exelon profits. New Ohio Bill to promote nuclear energy, excludes wind and solar. USA Nuclear Workers Compensation deliberately dragging out process? 60 years and $1.2 billion to dismantle Three Mile Island nuclear reactor. Hanford contractor responsible for radiation spread avoids penalty. USA’s Secretary For Promoting Nuclear Energy, Rick Perry, wants Yucca waste dump site, not a bit worried about earthquake danger. Climate change is getting REALLY serious – could produce Financial Crisis. SAUDI ARABIA. Saudi Arabia moves forward on developing a nuclear industry. Tensions in volatile Middle East region, as Saudi nuclear program accelerates. Saudi Arabia resists IAEA’s inspection regime, as it completes its first nuclear reactor. IAEA head UN nuclear inspector asks Saudi Arabia to agree to safeguards on nuclear material. CHINA. China will fall short of its nuclear power generation capacity target for 2020. China to Resume Approving Nuclear Power Plants. SWEDEN. Doubts on safety of Sweden’s copper canisters for radioactive wastes. UKRAINE. Ukraine’s President Poroshenko issues nuclear decree, demands new reactors be built. FRANCE. It’s likely that Flamanville nuclear reactor will be delayed yet again, with discussion on how to fix faulty welds. France’s Orano (formerly bankrupt Areva) to send MOX fuel to Japan. France’s ‘public consultation’ on old nuclear reactors – full of bureaucratic jargon – no debate took place. KAZAKHSTAN. Research on gene mutations caused by nuclear radiation – Kazakhstan . Russia keen to market nuclear reactors to Kazakhstan. Britain’s Ministry of Defence’s failure to dispose of retired nuclear submarines. Scottish National Party demands public inquiry into the decommissioning of nuclear-powered submarines. Britain’s nuclear submarines, intended to harm foreign lands, now pose grave danger at home! Massive costs of managing UK’s dead nuclear submarines. Westminster Abbey urged to cancel nuclear weapons ‘thanksgiving’ service . UK: No talks, no sites identified” regarding nuclear waste burial. Local Councils in England, Northern Ireland and Wales reject any involvement in nuclear waste dumping. UK and EU agree to continue nuclear fusion project in Britain, despite Brexit. Safety rules relaxed for some UK radioactive wastes, due to fears of supply disruption after Brexit. Doctors want UK to be at the forefront of international nuclear disarmament. 4 Sound reasons why Blackwater Against New Nuclear Group (BANNG) opposes Sizewell nuclear project. Explosion at Vulcan nuclear submarine site at Dounreay. BRAZIL. Former Brazilian President Michel Temer indicted on corruption charges Involving nuclear plant bribes. SPAIN. Spain to Shut Down Nuclear Plants And Push Forward Clean Energy Plan. GERMANY. Renewables provide over half of German net power in March . CANADA. Canada replaces largest North American coal plant with solar. NEPAL. Nepal assures South Asian doctors that UN Treaty on the Prohibition of Nuclear Weaponswill be ratified soon. DEMOCRACY NOW APRIL 08, 2019 Commemorations—as well as protests—were held last week to mark the 70th anniversary of the formation of NATO, the North Atlantic Treaty Organization. President Trump used the anniversary to push for NATO countries to increase military spending. During an Oval Office meeting with NATO Secretary General Jens Stoltenberg, Trump demanded Germany and other NATO countries increase their military spending from 2 to 4 percent of GDP. The push for more military spending could benefit U.S. weapons manufacturers including Boeing. This comes as Acting Pentagon Chief Patrick Shanahan is under investigation for improperly advocating on behalf of Boeing, where he worked for 30 years. We speak with Joe Cirincione, president of the global security foundation Ploughshares Fund………. JOE CIRINCIONE: We’re cursed in this discussion by a very narrow definition of national security. We’ve all come to accept that national security equals military forces and weapons, when, in fact, as you point out, a national security is more often determined by the health and welfare of its citizenry, the system of justice, whether citizens feel that they’re engaged in the country and have a role in the governance of that country. And spending on military is just one small part of national security, but this has become the test of whether a country is carrying its fair burden. So, burden sharing with NATO countries has been an issue in this town for decades. Republicans and Democrats have both harped on it, because it’s kind of an easy way for them to show that they’re tough, that they’re strong. But let’s put this in perspective. What are we talking about here? The world as a whole, every year, spends about $1.7 trillion on military weapons and forces. One-point-seven. The United States and our NATO allies account for $1 trillion of that. So more than half of all global spending is spent by the United States and our NATO allies. The NATO allies alone account for about $240 billion. That’s what they spend. What are they spending it to guard against? Well, if you think that Russia is the main threat, Russia only spends about $66 billion every year on defense. In fact, its spending dropped by 20% between 2016 and 2017, the last year we have figures for. So, its spending is going down. So why this demand for the NATO allies to spend more, when they’re beset with all kinds of problems that have nothing to do with military, all kinds of internal, economic, immigration problems, social justice problems, health and welfare problems? Why? Well, one, it’s simple. The 2% solution, it’s a simple mantra that is repeated. And, two, this directly benefits military contractors. Who makes the money off of this? Well, most of the money that we spend in this country on defense, and that the Europeans spend, go to a relative handful of defense contractors: Boeing, Lockheed Martin, Northrop Grumman, Raytheon, etc. And they lobby incessantly for these kind of increases, in Washington, in NATO headquarters, in the capitals of Europe. And now we have the absurd situation where a 31-year veteran of Boeing, a corporate executive, Patrick Shanahan, is the acting secretary of defense. I mean, this is such an obvious conflict of interest, you would think that people would say, “Well, no, you can’t do that.” But, of course, this is Trump’s Washington, where oil industry executives are running the EPA, and pharmaceutical companies run the FDA, so it’s become accepted. But it’s not right. It’s not fair. And it distorts us. And it’s dangerous. Just one last fact: If you take Trump at his word that he wants them to contribute 4%, well, that means you want Europe to double their defense spending, from about $230 billion to $460 billion. For what? To do what? What does this go towards? We’ve lost track of the real security needs we face, and we’ve become obsessed with spending more and more on military weapons that in fact have only a minor role to play in the national security of a country.-year veteran of Boeing, a corporate executive, Patrick Shanahan, is the acting secretary of defense. I mean, this is such an obvious conflict of interest, you would think that people would say, “Well, no, you can’t do that.” But, of course, this is Trump’s Washington, where oil industry executives are running the EPA, and pharmaceutical companies run the FDA, so it’s become accepted. But it’s not right. It’s not fair. And it distorts us. And it’s dangerous. Just one last fact: If you take Trump at his word that he wants them to contribute 4%, well, that means you want Europe to double their defense spending, from about $230 billion to $460 billion. For what? To do what? What does this go towards? We’ve lost track of the real security needs we face, and we’ve become obsessed with spending more and more on military weapons that in fact have only a minor role to play in the national security of a country……. AMY GOODMAN: Joe, you’ve written several books, one of them Nuclear Nightmares: Securing the World Before It Is Too Late, and Bomb Scare: The History and Future of Nuclear Weapons. Do you think it’s too late? And what do you think needs to happen? JOE CIRINCIONE: All the arrows are pointing in the wrong direction, so nuclear storm clouds are gathering. For example, John Bolton, the national security adviser, has been very successful in sabotaging talks with North Korea. The one benefit of the Trump presidency might be that he could negotiate a solid deal with Kim Jong-un. It now appears, according to reports this week, that at the Hanoi summit John Bolton sabotaged those talks by presenting a list of unacceptable demands, an all-or-nothing offer to the North Koreans that caused them to call off the talks. He has killed the Intermediate Nuclear Forces Treaty. This is a Ronald Reagan treaty, that successfully pulled out and destroyed 3,000 nuclear weapons from Europe. You may have been covering this in the ’80s, Amy. When we were pouring nuclear weapons into Europe, massive demonstrations. The biggest rift in the NATO alliance until this point was that crisis. Ronald Reagan and Mikhail Gorbachev negotiated a treaty. Bolton never liked it. He killed it. And why did he kill it? He used the excuse of a Russian violation, which I believe is real but the kind of thing that can be fixed within the treaty framework. And what—but why did they kill it? Because there are elements in the U.S. military and the defense industry that want to build new nuclear weapons that were prohibited by that treaty, to deploy against China and to put into Europe. So, weeks after we announced we were withdrawing from the treaty, it was revealed that the Department of Defense is starting manufacturing, research and development and production of a new ground-launched cruise missile, a so-called GLCM. You may remember this phrase from the ’80s. It was GLCMs and Pershing IIs that we were pouring into Europe. And so, Secretary General Stoltenberg sought to assure the Congress that NATO would not accept a new intermediate nuclear forces nuclear weapon in Europe. So Bolton is doing this a little cleverly. It’s like a Trojan horse. It’s going to be a conventionally armed ground-launched cruise missile, a conventionally armed GLCM, that will go into Europe, perhaps in the next couple of years. But, of course, you can easily swap out the conventional warhead for a nuclear warhead. So I think they’re planning to put these weapons in to avoid the kind of mass demonstrations, and later, possibly, equip them with nuclear weapons. This is the kind of Cold War policy that we thought was behind us. We thought the arms race was over. It’s not over. We are in a new arms race. Every single nuclear-armed country is building new nuclear weapons and heading towards a confrontation point. You’ve got to be a real optimist to think that you can keep thousands of nuclear weapons in fallible human hands indefinitely and something terrible is not going to happen. I am very worried about the direction of the arms race, the direction of our policies. AMY GOODMAN: Joe Cirincione, president of Ploughshares Fund, author of Nuclear Nightmares: Securing the World Before It Is Too Late and Bomb Scare: The History and Future of Nuclear Weapons. To see Part 1 of our interview, go to democracynow.org. This is Democracy Now! 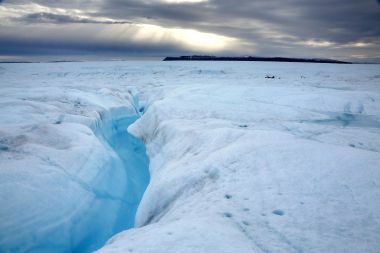 UNIVERSITY OF ZURICH 8 Apr 19, Melting ice sheets in Greenland and the Antarctic as well as ice melt from glaciers all over the world are causing sea levels to rise. Glaciers alone lost more than 9,000 billion tons of ice since 1961, raising water levels by 27 millimeters, an international research team under the lead of the University of Zurich have now found. Glaciers have lost more than 9,000 billion tons (that is 9 625 000 000 000 tons) of ice between 1961 and 2016, which has resulted in global sea levels increasing by 27 millimeters in this period. The largest contributors were glaciers in Alaska, followed by the melting ice fields in Patagonia and glaciers in the Arctic regions. Glaciers in the European Alps, the Caucasus and New Zealand were also subject to significant ice loss; however, due to their relatively small glacierized areas they played only a minor role when it comes to the rising global sea levels. The global mass loss of glacier ice has increased significantly in the last 30 years and currently amounts to 335 billion tons of lost ice each year. This corresponds to an increase in sea levels of almost 1 millimeter per year. “Globally, we lose about three times the ice volume stored in the entirety of the European Alps – every single year!” says glaciologist Zemp. The melted ice of glaciers therefore accounts for 25 to 30 percent of the current increase in global sea levels. This ice loss of all glaciers roughly corresponds to the mass loss of Greenland’s Ice Sheet, and clearly exceeds that of the Antarctic. ………The International Atomic Energy Agency indicates better ways to store nuclear waste are to bury it in “caverns, vaults, or silos, at least a few tens of metres below ground level, and up to a few hundred metres below ground level.” It does state, however, that a near-surface facility would be sufficient for low-level waste, such as decommissioned structures, old laboratory materials and soil. CNL’s environmental impact assessment is expected to be ready for review this spring, three years after the Canadian Nuclear Safety Commission launched the environmental assessment process. Public hearings are to follow. Many environmental effects being seen in the country are ‘effectively irreversible, say authors of study. By Sintia Radu, Staff Writer April 5, 2019 CLIMATE CHANGE IS ONE of the top threats that people in countries say confronts the world. Global warming is often referenced as a consequence of pollution and human activity. Levels vary across countries, yet a new report is showing a dire concern for one of the largest countries on the planet – Canada. The North American nation is warming on average at twice the rate of the rest of the world, according to a new scientific report produced by the Environment and Climate Change Canada, the national government agency responsible for coordinating the country’s environmental policies. The average temperature in Canada today is 1.7 degrees Celsius (3 degrees Fahrenheit) higher than 70 years ago, according to the report. By comparison, the average global temperature increase during the same period is 0.8 degrees Celsius. Additionally, the warming produced from carbon dioxide emissions from human activity is “effectively irreversible,” the report’s authors warn. Changes in temperature already show in various areas of the country and scientists say they will only intensify. Precipitation is projected to increase, on average, yet summer rainfall may decrease in particular regions. The Canadian Arctic and Atlantic Oceans have been the most impacted, with both experiencing “longer and more widespread sea-ice-free conditions”, the report says. The availability of freshwater is changing, the report says, with the risk of water supply shortages expected to increase in the summer. Research for the report began in February 2017 and draws “primarily from existing sources of information that have been peer-reviewed and are publicly available,” the authors say. Earlier this year a global survey of people in 26 countries named climate change as the greatest threat to international security. 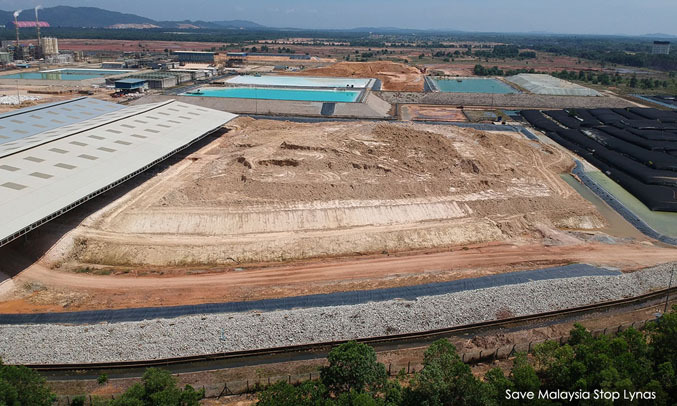 The controversy is over the definition of wastes from the Lynas’ water leach purification (WLP) process, which contains thorium and uranium. Lynas claims that the wastes are naturally-occurring radioactive material (called NORM), while we claim that the wastes are not naturally-occurring, but have been technologically-enhanced and should be called technologically-enhanced naturally-occurring radioactive material known as TENORM. Lynas is clearly distorting the facts. First of all, the thorium and uranium containing wastes generated by Lynas are not found to naturally occur in the Gebeng area, where the plant is located. On the contrary, the raw material which is processed by the Lynas plant is lanthanide concentrate that contains the thorium, uranium and the rare-earth. This raw material is processed and imported from the Mount Weld mine in Australia and is brought to Malaysia. It is then subject to further processing in Gebeng by Lynas. Therefore, how can it be said that say that the thorium and uranium are naturally occurring in the soil, water and in food when they were not there before in the Gebeng area, if not for the Lynas operations? Moreover, what is even more significant is that we are talking about the generation of an accumulated amount of more than 450,000 metric tonnes of radioactive wastes from the Lynas operations thus far. To call this naturally-occurring radioactive material is indeed unscientific. Kings Bay Plowshares: Peace Activists Face 25 Years for Action at U.S. Nuclear Submarine Base Democracy Now 8 Apr 19, A group of peace activists have been jailed for over a year before trial for entering the Kings Bay Naval Submarine Base in Georgia last April to protest U.S. nuclear weapons. The action took place on April 4, 2018—the 50th anniversary of Martin Luther King’s assassination. Armed with hammers, crime scene tape and baby bottles containing their own blood, seven anti-nuclear activists secretly entered Kings Bay—one of the largest nuclear submarine bases in the world—under the cover of night. NY Radiation Specialists Unveils State-of-the-Art Linear Accelerator at NYCBS benzinga, 8 Apr 19, Port Jefferson Station, NY, April 08, 2019 –(PR.com)– On Tuesday, March 25, New York Radiation Specialists unveiled its brand new Varian Halcyon Linear Accelerator, at New York Cancer & Blood Specialists’ Eastchester Center for Cancer Care. The “NYCBS” Eastchester location is a multi-lingual facility located at 2330 Eastchester Road in the Bronx, just minutes from the Pelham Parkway. The Halcyon makes the NYCBS Eastchester Center for Cancer Care the most state-of-the-art radiation site in the region. This cutting edge machine boasts features and benefits previously considered impossible. The Halcyon uses optimized guided radiotherapy technology to shape radiation beams to precisely match a patient’s tumor. These “beam shapers” deliver pinpoint accuracy of radiation to the areas that need it, protecting surrounding tissue and reducing the risk of side effects. In addition, the sophisticated design drastically reduces a patient’s table time. Since the accelerator is a self-contained unit, it is free to rotate up to four times faster than traditional models. The Halcyon can deliver effective radiation therapy in as little as five minutes. “Having the ability to deliver more effective treatment in less time is a win for the patient and aligns perfectly with New York Cancer & Blood Specialist’s mission to provide the highest quality of care,” said Dr. Reuven Grossman, an NYCBS Radiation Oncologist. “This new technology provides the most targeted and effective radiation treatment available anywhere.” Patients even have the option of checking themselves into the unit using a touchscreen and their I.D. administration for not doing more. waste storage tanks and tunnels. How safe is the Ottawa River from nuclear waste? Canada’s National Observer By Lauren Hicks, Dana Hatherly, Christian Paas-Lang, Mateo Peralta & Adam van der Zwan April 8th 2019 “……..Canada’s first nuclear reactor began operating at Chalk River, about 160 kilometres northwest of Ottawa. Since 1944, the facility has served as Canada’s major nuclear science hub. Researchers at CRL have studied reactors, nuclear energy and weaponry and produced medical isotopes for patients around the world. Fresh concern erupted after CNL announced detailed plans to build a nuclear disposal facility to permanently house one million cubic metres of radioactive waste — about 400 Olympic-sized swimming pools worth. The waste has accumulated over decades of Chalk River’s operations. It includes low-level material, such as equipment from operations that has been irradiated and buildings that housed the reactors, and intermediate-level waste, such as filters used to purify reactor water systems and reactor core components. The irradiated material sits anywhere from a few metres to a few kilometres from the Ottawa River. ……..
Petawawa’s director of public works said he has never met with Chalk River officials over potential water quality hazards in the area……..
Members of CNL’s team acknowledge there are differences in international standards when it comes to certain substances, including tritium and strontium………..
Saudi Arabia has nearly completed construction of its first nuclear reactor, sparking fears about the country’s quest for nuclear power. New satellite images, first published by Bloomberg, show construction on the building site has made significant process over the past three months. The three images below [on original] show the rapid developments on the site between April 2017 and today. The images show the construction of a 10-metre high steel vessel, which would contain nuclear fuel, and construction work on the surrounding concrete building. The facility is located in the southwest corner of the King Abdulaziz City for Science and Technology in Riyadh. ………Robert Kelley, a nuclear expert and veteran of the US Department of Energy, said the reactor could be completed in “nine months to a year”. He said the construction appears to be small in size and intended for research and training purposes. Mr Kelley also said that, before the kingdom can insert nuclear fuel into the reactor, it would have to abide by international agreements. He said it had been surprising to him “how non-transparent” the kingdom had been in the process of building the reactor and “how they seem very cavalier about modifying their arrangements with the IAEA”. Mr Kelley was referring to agreements the kingdom has signed. The kingdom agreed to the Nuclear Nonproliferation Treaty three decades ago. In 2005, it signed an agreement with the IAEA known as the “small quantities protocol” that allowed countries with negligible nuclear programs to be exempt from regular inspections or nuclear monitoring. However, once nuclear fuel was brought into the country to operate this small reactor, inspections by the IAEA would be required, Mr Kelley added. …….. He said the Saudi reactor was being built by the Argentinian government-owned company INVAP. Before Argentina brings nuclear fuel to Saudi Arabia for the reactor, the IAEA agreement in place that exempts Saudi Arabia from inspections would need to be rescinded, Mr Kelley said. “I think it’s a 100 per cent certainty that Argentina is not going to supply uranium fuel to a country that doesn’t have a safeguards agreement in force,” he added. ………. the kingdom has previously pushed back against agreeing to US standards that would block two paths to potentially making fissile material for nuclear weapons. Last Friday, US Secretary of State Mike Pompeo was adamant that it was unacceptable for Saudi Arabia to become a nuclear power. The publication of the satellite images follows a struggle between the Trump administration and Congress over the sale of nuclear technology to Riyadh. Last month, The Daily Beast revealed the US Department of Energy had approved six authorisations for US companies that were looking to conduct nuclear-related work in the Middle Eastern kingdom. NRC recommends issuing early site permit for Clinch River Nuclear Site, OAK RIDGE TODAY, APRIL 8, 2019BY JOHN HUOTARI The U.S. Nuclear Regulatory Commission has issued a final environmental impact statement, and the staff has recommended, based upon the environmental review, issuing an early site permit for the Clinch River Nuclear Site in west Oak Ridge, where two or more small modular nuclear reactors could be built.The final environmental impact statement, or EIS, was issued by the NRC on April 3. A notice of the EIS and the staff’s recommendation were published in the Federal Register on Monday, April 8. The 935-acre Clinch River Nuclear Site is located in Roane County along the Clinch River………. Barbara Cecil, Truthout, 8 Apr 19, A global student uprising is underway, with youth worldwide demanding that adults face the climate crisis head on. They need a strong foundation in themselves and adult partnership for the challenges ahead. Youth leaders like Thunberg are rising up across the globe. I had the privilege of working with a group of them from the United World College of the Atlantic in early March this year when I co-led a retreat in the U.K. with 17- and 18-year-olds. There were six adults in the retreat as well as students from 11 countries. All of the students had been on the front lines of the most recent strike; all of them carry deep questions about their futures. A young woman from the Netherlands named Maura Van der Ark — whom I had met in the Amazon Rainforest two summers ago, as Truthout reporter Dahr Jamail and I conducted research for his book, The End of Ice — had organized the retreat to help fellow students find a solid footing in these times. Nuclear workers vote to strike over pay, David McPhee, https://www.energyvoice.com/other-news/196648/nuclear-workers-vote-to-strike-over-pay/ Workers including security guards at an airport and nuclear site have voted to take industrial action in separate disputes over pay and other issues.